Fresh from the farm. Great taste 2016. Easy to digest. Creamy and smooth. Suitable for a cow's milk free diet. Made with British goat's milk. No added thickeners or sugars. Gluten free. 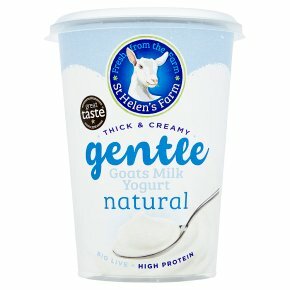 Suitable for vegetarians.Naturally thickened It takes two litres of fresh, pasteurised goats' milk to make one litre of our live goats' milk yogurt. Contains no added ingredients. Friendly bacteria Made with live cultures; Lactobacillius bulgaricus, Streptococcus thermophilus, Lactobacillus acidophilus and Bifidobacterium. Made with 100% British goats' milk from Red Tractor assured farms.